The Columbia College Summer Funding Program provides funding to Columbia College students participating in unpaid or low-paid summer internships related to their career pursuits and/or academic studies. Through the Columbia College Summer Funding Program students are awarded stipends via a competitive process which includes a written application and review by a committee of College staff from across campus. Provides support primarily for not-for-proﬁt, arts, government, public health, scientific research, and community outreach internship experiences. All qualified students who apply to the Columbia College Summer Funding Program and receive Columbia grant-based financial aid with a summer work expectation (Student Contribution) are encouraged to also apply for a Work Exemption Program (WEP) grant. Students do not need to submit a separate application to the Work Exemption Program. Simply check the Work Exemption Program box on your funding program application form to be considered. The WEP grant will replace a student’s summer work expectation (Student Contribution). Columbia College Summer Funding Program awards are made possible thanks to the generosity of Columbia College alumni/ae, parents, and friends. Students selected to receive an award will be matched with one of the following funds based on the fund criteria. Andrew Hyman Fellowship in Public Service Fund — provides support for students to pursue U.S.-based internships in the public sector, including government, community and public service. Eric H. Holder Jr. Initiative for Civil and Political Rights Internship Fund - supports students with unpaid or low-paid summer internships at non-profit and non-governmental organizations that are engaged in aspects of equal protection, equal rights, civic engagement, leadership and democracy, social justice, inequality and voting rights. Pritzker Pucker Summer Internship Fund — supports students, regardless of financial need, pursuing summer internships in art, media, culture and technology to facilitate broader access to these fields. Institutional funding through this program is made available with the sole intention of supporting students’ living expenses (such as housing, food and travel expenses). This support enables students to participate in unpaid or low paid opportunities. Funding is not provided in lieu of compensation for work and supervisors are required to acknowledge in the Employer Veriﬁcation Form that participating organizations are compliant with the US Department of Labor’s Fair Labor Standards Act (FLSA) and other applicable state and local legislation. Here are a few suggestions to search for unpaid or low-paid internships. To learn more about ﬁnding an internship please visit the Internships section of our website. Check out the Oﬃce of Student Engagement and the Community Impact for opportunities to contribute to your community. 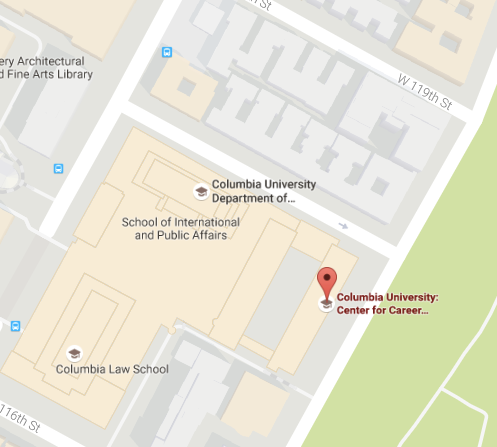 Did you know that Columbia has 214 research centers and institutes? Students also frequently ﬁnd research opportunities through their academic department and professors. * Many Columbia College Summer Funding Program donors require that selected students are recipients of Columbia grant-based ﬁnancial aid. If you are unsure if you receive grant-based ﬁnancial aid, please contact the Oﬃce of Undergraduate Financial Aid & Educational Financing. The Columbia College Summer Funding Program accepts applications for unpaid or low paid summer internships only. Monday, April 15, 2019, at 11:59 pm. To apply, complete the common Summer Funding Programs application form. Resume — For resume help, please feel free to utilize CCE’s walk-in hours or schedule an appointment with a counselor. You can also review CCE’s Design Your Next Steps guide. Employer Veriﬁcation form — This online form must be completed by your direct supervisor. Please forward the link to your employer. address your commitment to completing required webshops, submitting a donor thank you letter and a reflection project. By submitting an application, you authorize the Center for Career Education to conduct academic, disciplinary and ﬁnancial aid checks to conﬁrm program eligibility and inform funding decisions. Certain University policy violations may disqualify you from consideration for this program. It is critical that you thoroughly familiarize yourself with the Undergraduate International Travel Policy and complete all steps outlined above. For related questions, contact utrc@columbia.edu. If you do not submit a School Sponsorship application and complete all subsequent pre-departure requirements, you may face disciplinary action. I need to conﬁrm acceptance to my internship program prior to the APPLICATION Deadline. Can the Committee review my application early? We cannot review your application prior to the deadline. Applications are reviewed collectively by a committee who meets after the application deadline. The timeline for applications is based on internship deadlines for the majority of students. I do not receive Financial Aid; however, I can demonstrate FInancial need. Can I still apply? We encourage you to submit an application. There are a handful of donor funds that do not require students to be in receipt of Columbia grant-based ﬁnancial aid. Can I apply to both THE COLUMBIA COLLEGE SUMMER FUNDING PROGRAM and the Work Exemption Program? All qualified students who apply to the Columbia College Summer Funding Program are encouraged to also apply for a Work Exemption Program (WEP) grant. Students do not need to submit a separate application to the Work Exemption Program. Simply check the Work Exemption Program box on your funding program application form to be considered. The WEP grant will replace a student’s summer work expectation (Student Contribution). My internship provides a modest stipend. Am I eligible to apply? Yes. The committee will consider funding students with low-paid internships. Low-paid is defined as compensated at less than the equivalent of New York State minimum wage — less than $15/hr. How competitive is the COLUMBIA COLLEGE SUMMER FUNDING program? The Columbia College Summer Funding Program is highly selective and funding is limited. Interested students are encouraged to submit a strong, well-written personal statement that clearly articulates their internship and their goal in pursuing their opportunity. Deadlines for the Summer Funding Programs are set after carefully considering a date that will allow the greatest number of students an opportunity to take advantage of the program. The funding program committee aims to notify students of a decision on their application with enough time for them to consider their employment plans if they are not selected for the program. The funding program committee begins reviewing applicants immediately following the application deadline. Students who are selected for the program are chosen within the context of the applicant pool for that semester and additional, individual reviews for students who miss the application deadline are not offered. We do not offer extensions to the deadline. If you will be waiting to receive a final offer of employment at the time of the application deadline please contact the funding program committee directly at cce-funding@columbia.edu to discuss where you are in the interview process. Because the committee meets to review applicants immediately following the deadline, extensions to the deadline are not offered. If you will be pursuing more than one internship, research, or volunteer opportunity during the semester or summer you may apply for a funding program award to support these multiple opportunities. At the start of the application, you will be asked to select how many opportunities you have. Based on your selection, you will then have the ability to enter application information for up to three opportunities. Please review our website for application instructions and ensure that you respond to the personal statement prompts for both opportunities. It will also be important to discuss how you will manage your time pursuing multiple professional endeavors. Your supervisors will each need to submit Employer Verification forms detailing your work commitment at each organization. You only need to submit one letter of recommendation and budget form (during the summer). I received a FUNDING PROGRAM award last year. Can I apply again? As long as you meet all of the eligibility requirements, you can apply again for funding. Would you recommend submitting a letter of recommendation from a professor or an employer? Your letter of recommendation should come from the person who knows you best, can speak well of your academic, extracurricular and professional accomplishments, and who can comment on your character such as a professor, advising dean or supervisor. We advise against asking a teacher/coach from high school to write your recommendation. We will not accept letters of recommendation written by family members, friends, resident hall advisors, student leaders, members of student organizations or classmates. Your letter of recommendation must be on official letterhead, dated and signed. Your recommender should upload your letter of recommendation directly to us. Where have previous award recipients interned? In past summers, recipients have interned locally, nationally and internationally at organizations such as The Alvin Ailey Dance Foundation in NYC, Boston Children’s Hospital, the Center for Microﬁnance in India, Engineers without Borders in Uganda and Ghana, the Mayor’s Oﬃce of Immigrant Aﬀairs in NYC, the Women’s Foreign Policy Group in Washington DC, and numerous laboratories and research centers on Columbia’s campus. Are there any fellowships that would cover expenses for a winter break and /or spring semester unpaid internship? Eligible students can apply to the Work Exemption Program for exemption of their in-school work expectation during the fall and spring semesters. The Fellowships Oﬃce also has a comprehensive database of opportunities and their staﬀ are available to meet with students. Are there additional funding sources available to supplement a COLUMBIA COLLEGE SUMMER FUNDING PROGRAM award? Yes, there are numerous fellowships and grants available to fund summer opportunities. The Fellowships Oﬃce also has a comprehensive database of opportunities and their staﬀ are available to meet with students. Students could also reach out to professors, departmental administrators and teaching assistants to learn of fellowships and/or awards in their ﬁeld of study. I am not eligible to apply to THIS PROGRAM. I really want to do an unpaid internship this summer; however, without funding, it will not be possible for me to pursue this opportunity. What do you recommend? The Fellowships Oﬃce also has a comprehensive database of opportunities and their staﬀ are available to meet with students. Students could also reach out to professors, departmental administrators and teaching assistants to learn of fellowships and/or awards in their ﬁeld of study. Most students are unaware that this program exists and forfeit continuing extracurricular activities that they had been pursuing during the school year for more lucrative summer opportunities that may not be as beneficial to their career goals. Go for it, apply — the donors and CCE are so useful and completely exceeded my expectations of what this program would be!